The holy Festival of Muslims is celebrated on 30th of August. Eid ul-fitr is the last day of Ramadan, or the 1st day when the Shawwal crescent of the moon is visible. Eid ul-Fitr is a time when Muslims who have fasted during Ramadan celebrate with a feast. Now prepare to celebrate this festival, to shop with Choice Sarees. 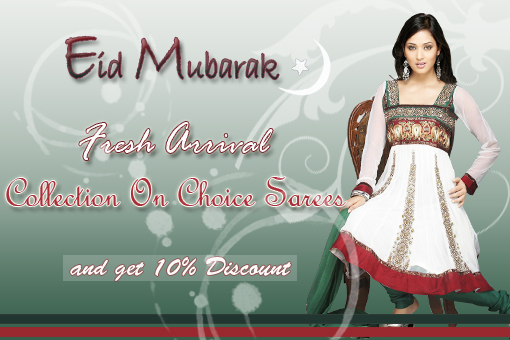 Here Choice Sarees is presenting new fresh arrival collection for Eid Special. And presents an wonderful range of Eid Traditional Sarees, Latest Designer Sarees, Fancy Party Wear Salwar Kameez, Printed Chudidar Suit, Designer Anarkali suit, Lehenga Choli, Designer Lehenga Choli, and Latest Fashionable Kurtis. On this Occassion, Choice Sarees is offering 10% Discount to make your shopping more convenient. So ready for shopping with Choice Sarees. Choice Sarees gives you a warm welcome for shopping. We wish you all a very happy and peaceful Eid. May the blessings of Allah fill your life with happiness and open all the doors of success now and always. Eid Mubarak !!!!!! New Year’s Day marks the end of one year and beginning of the other. New Year is celebrated by all countries that measure yearly calendars. Most countries across the globe follow the Gregorian calendar and celebrate their New Year’s Day on January 1. In several countries January 1 is a holiday. Grand bashes, balls and parades are organized to welcome the New Year and bid adieu to the old. Choice Sarees brings joy and happiness with this new year with our newly added fashionable collection of Kurtis, logn tunics, Salwar kameez, Ladies suits, Designer Sarees, wedding Sarees, Designer Lehenga Choli etc. Enjoy new year with new fashion trend of our mind-blowing collection . Wish you Very happy New Year to All Our Customer, Friends!! !